Spring has arrived in Gramont in the heart of Gascony – just in time for our first guests of the season. We’ve had a full house, with our eager students arriving from USA and Australia! For the Americans it was a big family affair, with nine parents, daughters, daughters in law and a brother and his wife, all hailing originally from Wisconsin. The three Aussies making up the balance of the group were from Melbourne and Adelaide. After welcome aperitifs on Sunday evening the team enjoyed a 3 course dinner on the balcony overlooking the valley below. This was a great opportunity for everyone to become acquainted before the commencement of formal cooking classes starting Monday morning. 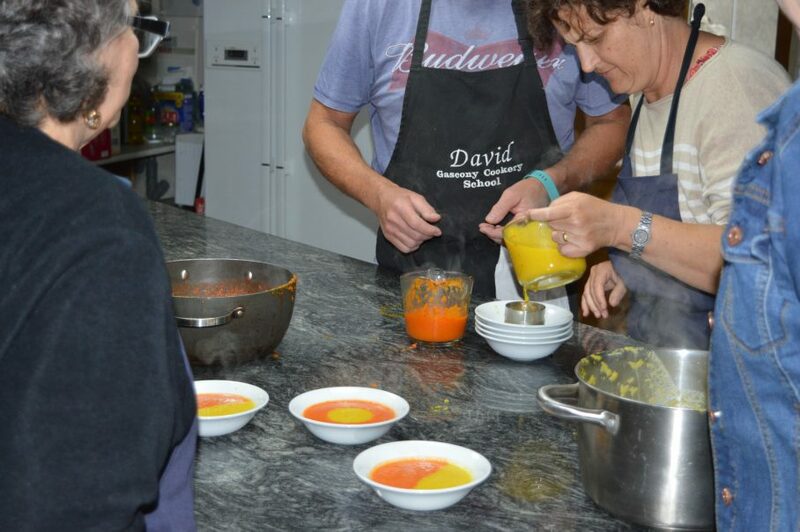 In order to ensure that everyone taking the course have sufficient “face time” with their chef instructor, the students were divided into two groups, one group starting with Chef David in the school, and the other with Chef Bernard at the close by Auberge. For the week these two groups alternated between Chef David and Chef Bernard so as to enable all students to get instruction in all the techniques and recipes covered. Among the skills taught were how to prepare some of Gascony’s signature dishes, such as fois gras, cassoulet, and magret of duck. Yum! Some stunning desserts were also made, including a sublime mousse chocolat and a lip smacking tarte citron. The week included a trip to a typical French market to buy some of the fresh vegetables required for the dishes to be prepared, and also an excursion to several cathedrals and a famous French bar for lunch. To top it all off, a trip and guided tour through one of the region’s highly regarded and very historic Armagnac producers in the quaint town of Condom was a particular highlight. 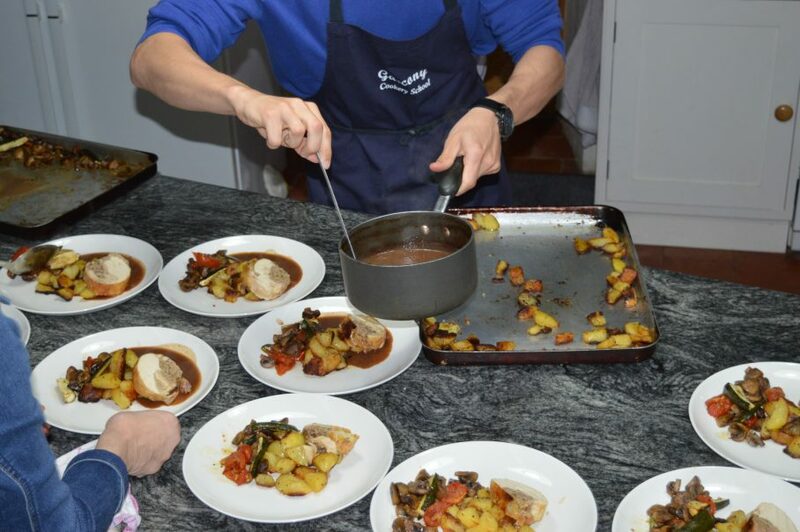 The students got to eat most of the dishes they had prepared, and were supplied with copies of all recipes used during the course. The week closed with a fabulous evening meal meal at the Auberge, during which many folk songs (and even the national anthems) of the USA and Australia were sung with gusto. After early morning departures on Friday, the Gascony Cookery School has a short break before welcoming the next class to embark on a marvellous cooking adventure……. We have limited availability for the remaining courses this year so check them out here….